How do you accurately describe a perfect day to those not with you? Universal Studios Singapore is a start...add in excitement, nausea, screaming, laughing, soaking, and unbridled enthusiasm from all and you start painting the picture! 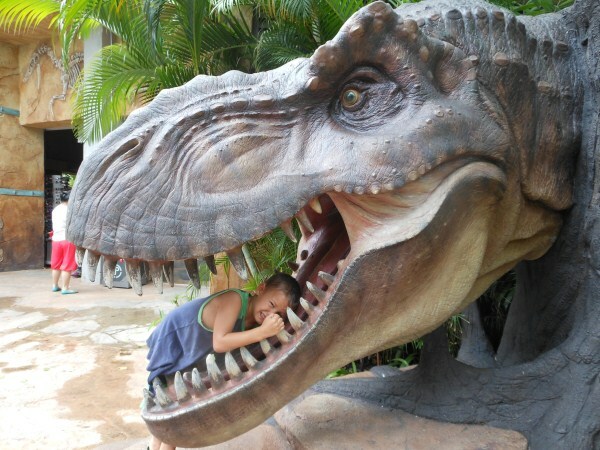 Part of our decision to go to Singapore was to check out all the amazing family friendly places to visit on the island. We booked our flight and started searching for activities and Singapore tours that would suit all of the boys. 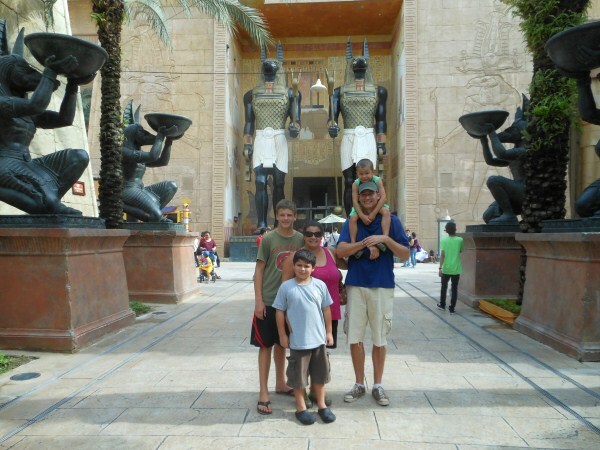 With a teenager, 9-year-old and a 5-year-old sometimes it is difficult to find an activity for all of them. 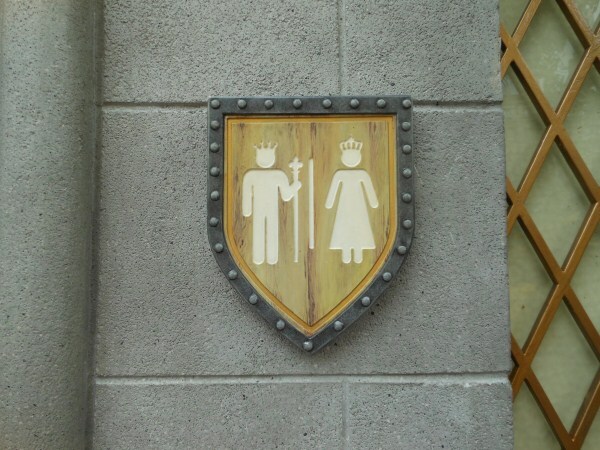 When Universal Studios offered to host us at their park we were thrilled, but I was slightly nervous that it was really a bigger kid type of park. We were all pleasantly surprised to see that this could not have been farther from the truth. We met with our host Mathew in the morning who gave us a brief introduction and tour of the park. We rented our huge and comfortable stroller for $3.30 (for the entire day), and then took off to explore, ride, laugh, get soaked, and so much more! 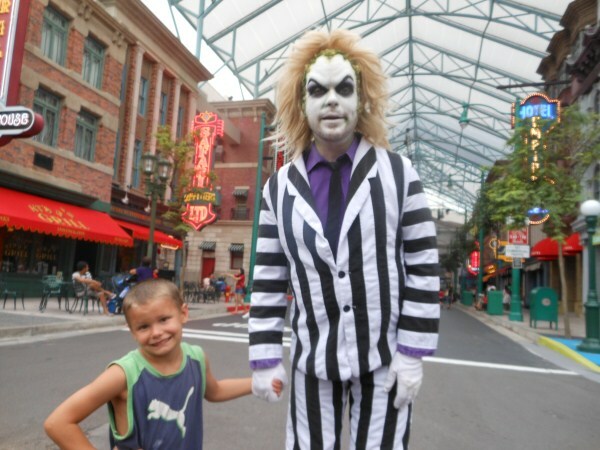 5-year-old with Beetlejuice...2 of a kind?? 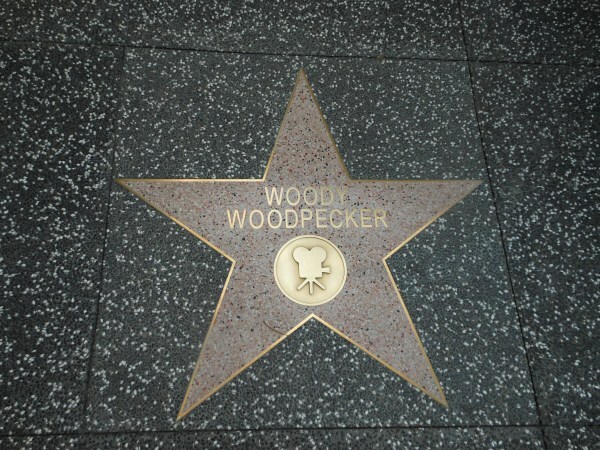 Upon entering, the first stop is Hollywood; a replica road filled with Hollywood memorabilia right down to the walk of stars on the sidewalk. Here you can shop to your hearts content and also enjoy a few shows such as Mel's Dinettes musical and Daddy O's hipster show. This is also the area you can find several of the restaurants in the park and see the extravaganza Monster Rock. "Stars" abound in this area so keep on the look out. 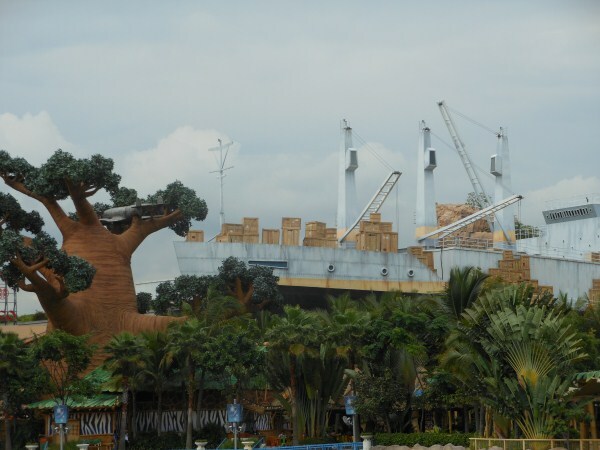 Next up is the Madagascar ride, complete with a giant replica of the cargo ship and lemur tree from the first movie in the series. Inside is the Crate Adventure ride, think "It's a small world" but with Madagascar characters. It was wonderful! I suppose some parts could be slightly scary to small kids but my 5-year-old was not scared at all. There are also a couple smaller rides, along with a huge themed gift shop that you are cleverly dumped into after exiting the rides like in the rest of the worlds in the park. There are a few spots to eat here as well. Shrek World has a clever and entertaining 4D show that, believe me, will get you jumping in your chair. 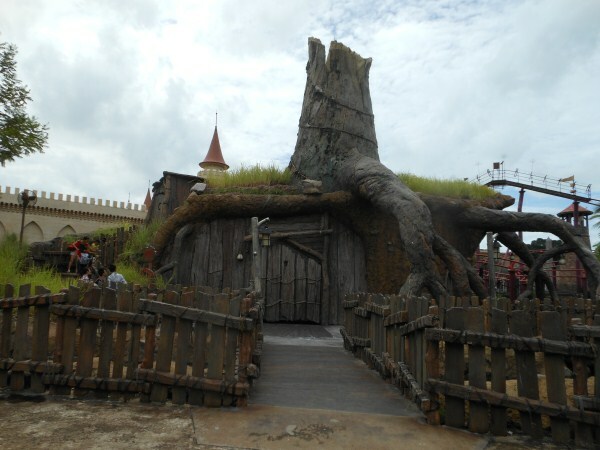 A great replica castle as well as Shrek's own mud pit round out the atmosphere while the donkey show, junior roller coaster (very short), and Magic Potion Spin ferris wheel will be enjoyed by all kids under 8. Again, there are a few restaurants including a really nice juice bar, we took our first break here! What else do you do with a giant Trex head??? The Lost World was one of our favorite areas of the park. 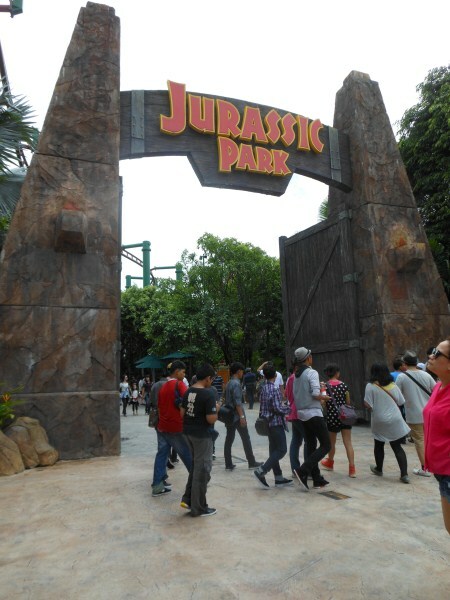 As you walk through the huge Jurrassic Park gates you feel transported back in time or at least back into a movie set! The best ride of this area, by far, was the Rapids Adventure. A heart-pounding, anticipation-filled water ride, where you really will get very wet! 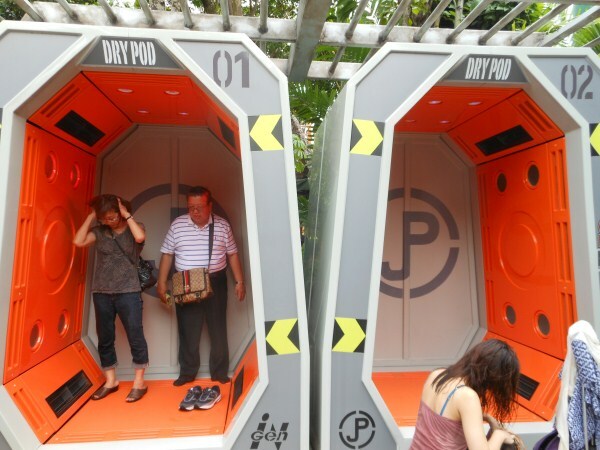 Have no fear, drying pods are available (one of the strangest things I have seen yet). Grab the ponchos they hand out (in our hurry to ride we neglected this step) and definitley store your stuff in a locker...no cameras on this one! The Canopy Flyer was great too, but may have been the shortest ride we were on all day, that was pretty disappointing. Rounding out this area is a few restaurants, another smaller kid ride, a rock climbing wall (added fee applies), and the Waterworld show. 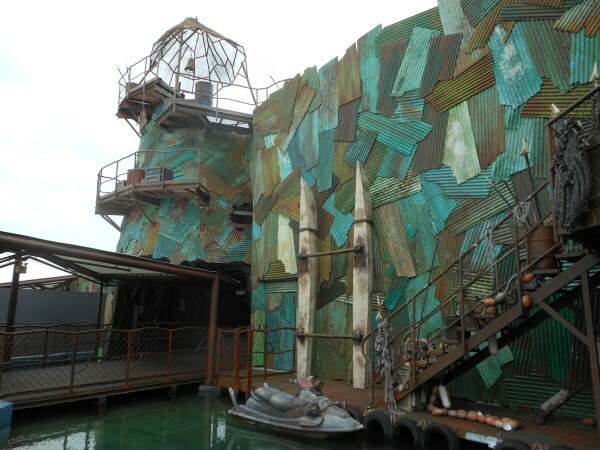 Definitely go see the Waterworld show! 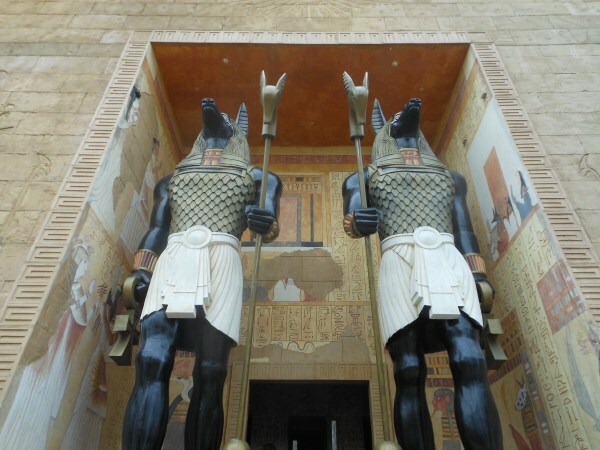 Right next door is Ancient Egypt. This is the smallest area of the park but offers one of our favorite rides of the day -- Revenge of the Mummy! It is a fast accelerator roller coaster set completely in the dark. We then went over the the drive your own car ride, where my 5-year-old was thrilled to give me a tour of the dessert landscape! For anyone over 8, the best area of the park hands down is Sci Fi City. 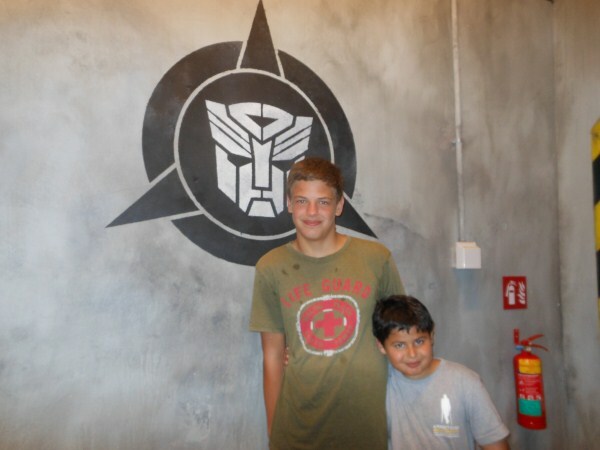 I cannot give away too much, but I can say that the Transformers ride is honestly the best ride I have ever been on. It was exhilerating, life like, and simply amazing! After that our second favorite was the Battlestar Galactica roller coaster. 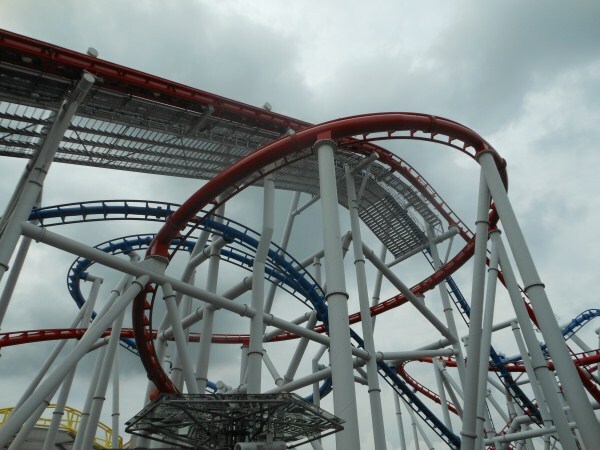 Admittedly, I was too sacred to go on the upside down one but the red track coaster was plenty fast and exciting as it intertwines and takes off with the other one giving the illusion and added worry that the 2 may crash. In this area there was also one more ride, some restaurants, and themed shopping areas. Last but not least is the New York area of the park. An area dear to our hearts as we grew up just outside NYC, it was fun running from one little detail to the next discussing the attention to detail and how it felt like home. We even chose to eat lunch here at Louis Pizza Parlor, expensive but a huge pizza with real New York flavor! 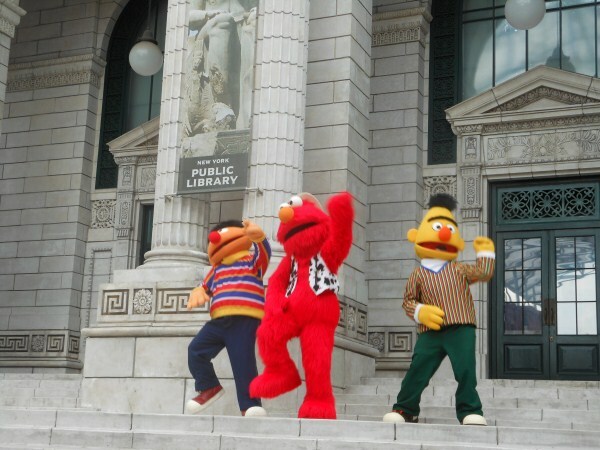 We also enjoyed the shows in this area, Sesame Street put on 2 different shows and then there is a great street dancing performance that includes the crowd and gets pretty busy with observers. You know it was a great day when Mr Energy himself just has to take a nap! Overall the day was just amazing, not a bad word could be said, especially with those Express passes! 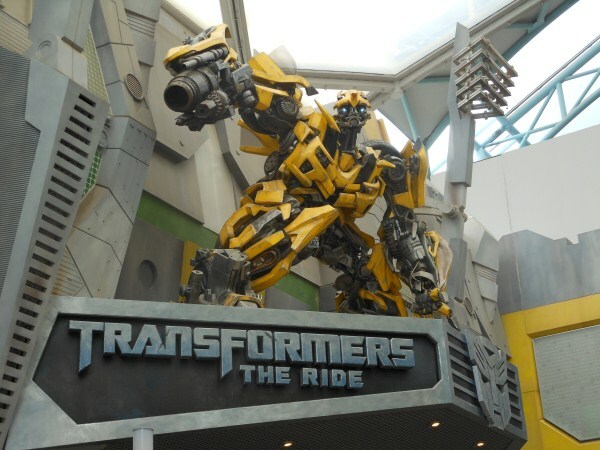 Do yourself a favor, book a hotel in Singapore, and spend a day at Universal Studios in Resorts World Sentosa on Sentosa Island. 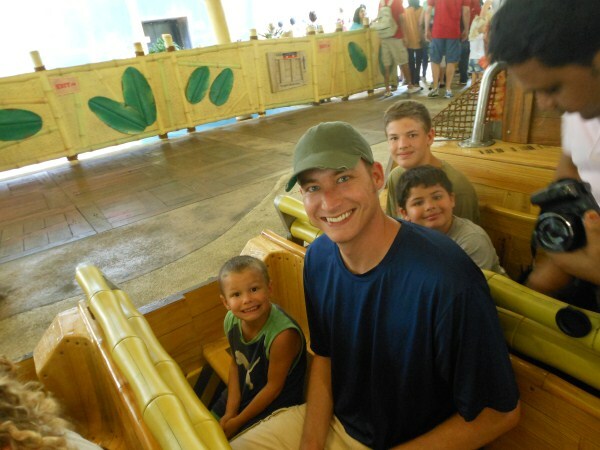 With so much to see and do it's the perfect spot for kids of all ages! Thanks so much for a wonderful day! If you have any kids under 6, or that just hate to walk, rent a stroller rather then bring one. They were huge, inexpensive and carried all our stuff. They even had 2 cup holders. Wheelchairs are also available for rent. Buy the Universal Express pass. While we were there the lines were not too bad but there is a lot to see and do and in 1 day. I don't think we would have gotten to it all. Not to mention the fact that waiting in a line, in the heat, with the kids who are so excited to just get on the ride OR so scared they are ready to back out any minute...can be miserable! Passes were 30 SD each and entitle you to cut the entire line for each ride 1 time. Expensive but if you can swing it, they are worth it! Don't skip out on the shows throughout the park, they are really entertaining. Be sure to get your hand stamped if you are leaving for a bit and want to return. We forgot and they almost didn't let us back in EVEN with our tickets. Smoking areas are provided around the park (just look on your map). They take it pretty seriously here in Singapore so best to stick to the designated areas. 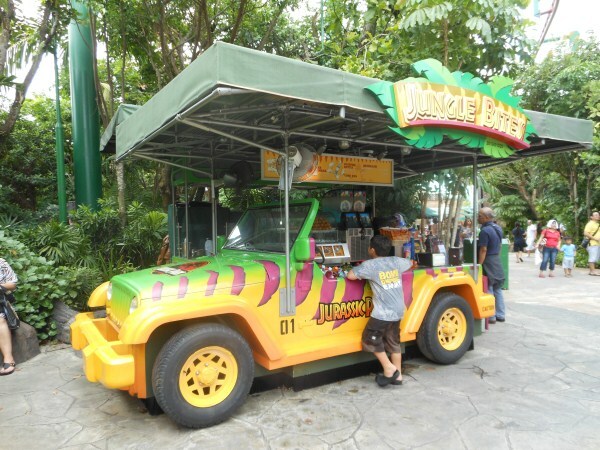 Reasonably priced water and snack areas are everywhere around the park. Throughout the park there are character meet and greets. If you see one jump up to them fast, the lines get long and they only stay out for a little while. Some rides are height restricted. 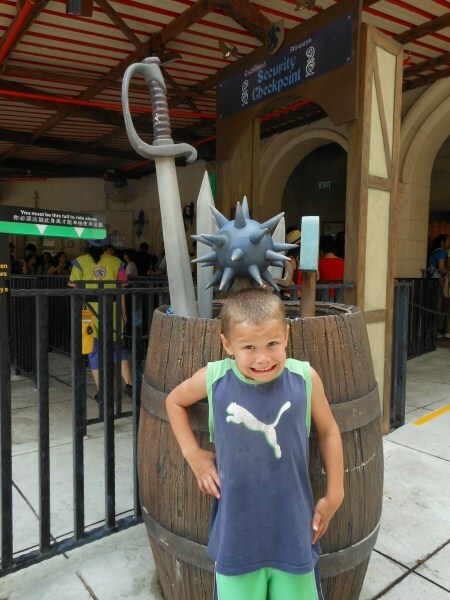 Our smallish 5-year-old could go on everything except the large roller coasters and the Mummy ride. Check online to avoid any disappointment. 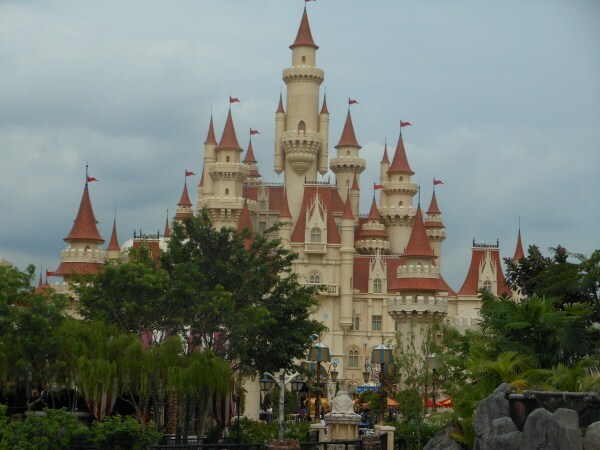 Be sure to follow Resorts World Sentosa on Facebook and YouTube! My favourite was the blue coaster, so fabulous. We also loved Jurrasic Park, Mummy and Transformers. Love Universal, love love love. Great post. Now I wish I got my nerve up for the bllue one...next time! Sounds so much like Dreamworld on the GoldCoast - or even Movieworld...and those Drying Pods - yep the theme parks have them! Weird but work well. 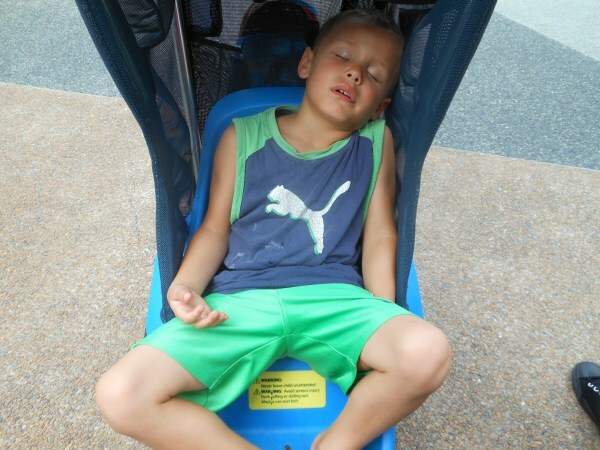 Ha, yes he does not usually sleep so we know he had a blast. The nice thing was that they had loads of fun things to do but it was set up in a giant loop and do it never felt like it was very big at all. That was awesome and I love the places. 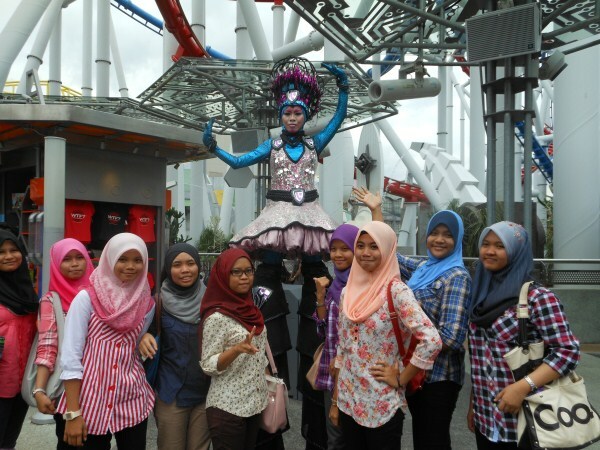 I should add this universal studio in my vacation list. I feel like flying to Singapore right now. I have been to Singapore but didn’t have enough time to go there.  So when I see these pictures it makes me sad. Love your country very much. Thanks for sharing your experience with us. 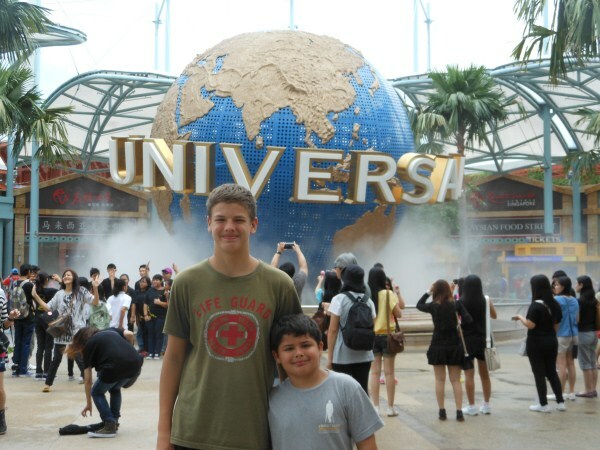 I now really want to go to Universal Studios in Singapore. My wife loves Jurassic Park. LOL, yes I agree. Seems like since I had kids my body just does not enjoy going upside down or spinning really fast!